Henry Cavill News: Cavill Conservation: Big Month For The Ploughshare Tortoises! Cavill Conservation: Big Month For The Ploughshare Tortoises! It's a time to celebrate at Durrell Wildlife and Cavill Conservation, as they work to save the most threatened tortoise on the planet. Henry got to meet some ploughshare tortoises last summer, and recently Durrell announced they've reached their goal of releasing 100 of them into the wild! The Jersey Evening Post also just shared two new pictures of Henry from his August, 2014 visit to his hometown park. 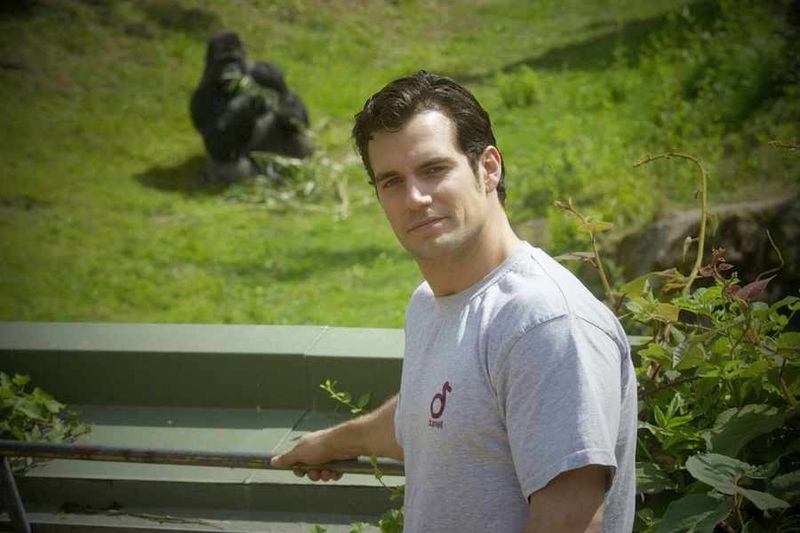 You can follow Henry's updates at cavillconservation.com, and even join his Gorilla family! -- We look forward to hearing what comes next. I don't see why not. It is close to his heart, something that he loves from his childhood. His work and love with Durell should remain as so. Other people's wrong doings should affect the good works Henry has done and will continue to do in the future. Henry is his own person separate from everything else. As well, he is an adult and deserves respect as we all do and want. Bravo Henry for all your good works! WE Support you! Sorry, should NOT affect. Forgot the "not"
Bravo to you River for pointing that out in a positive way! I completely agree, Henry and Durell wildlife are one. Something that's so close to his heart should definitely stay there. I look forward to his good works with Durell and Royal Marines. By the way going nuts over the "Man from uncle" trailer, looks amazing can't wait to see it! Thank you too, Jc. We are so grateful to have such wonderful readers that support Henry through thick or thin and especially with his charity work. Please know you are the heart of this blog. And yes, The Man from U.N.C.L.E. will be absolutely fabulous! Thanks to you for your kind words, we need more of that! And yea..losing it over "Man from uncle" HCN can you guys put up a pic of Henry in the suit wearing the sunglasses, you have it in a gif but I can't seem to get it just as a image. Thank you, I would appreciated:) ok back to jc. Yes Royal Marines as well, love those royal Marines (wink) spread the love people! Thanks HCN for all your coverage, you are the first site I go to, to find out about Henry. Keep up the great work! And thanks to everyone who post there great pics and story's. I look forward to them every day. River, thank you so much for your kind words and for the support for Henry in everything he does. We're on the same page! P.S. Your pic of Solo in sunglasses coming up in our next post. I love you HCN! Thank you so much, you made my day:) can't wait for the pic. Loving the LOVE....go Henry and cavillconservation.com, Durell and the Royal Marines muah! For all his good works with charity's as well as being really good to his fans -THAT should be the only reasons to love and support him not his personal life. HCN is there anyway Henry can see these messages? I would love for him to know we support him as do many others. I just got on cavillconservation and subscribed, as well as the royal Marines site, I'm so pumped I'm going to work out:D check in later. Thanks MSM, jc and staff writers of HCN!! Lmao! You are contagious, I think I will do the same. River, know that he knows you support him. But we'll make sure to mention it to him next time we see him. Promise. I just worked it out! feeling good. I<3Henry I'm going to watch that "Man from uncle trailer again, can't get enough of it. August is a long way off, what am I going to do!